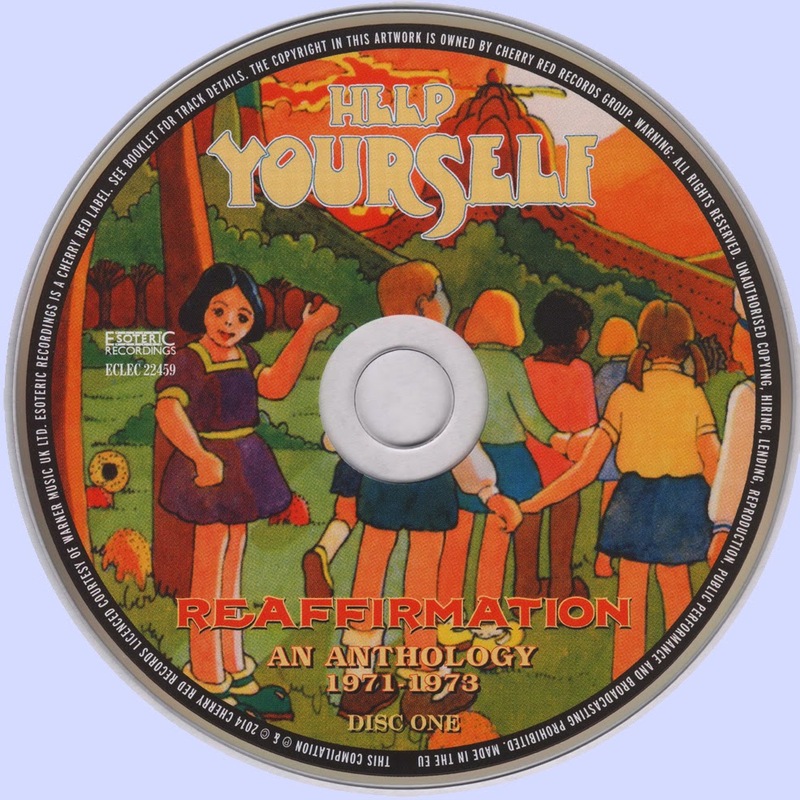 Help Yourself formed in 1970, and although they hailed from London physically, their musical souls were firmly rooted in Laurel Canyon. Leader Malcolm Morley’s finely crafted songs predated the current Americana fixation by over 40 years, and at the time Help Yourself remained a well-kept and low selling secret. From early in the band’s existence a close relationship was forged with United Artist label mates Man, the two bands frequently playing gigs and tours together, and later swapping band members in a manner that would delight Pete Frame. Rolling Stone, upon hearing Help Yourself’s self-titled first album in spring 1971 stated that singer Malcolm Morley “sounds more like Neil Young than Neil Young does”. Oddly, the song from that LP that sounds most like the famous Canadian is titled Old Man, and although it is a different song it is very similar in pace, tone, and sentiment to the far more well-known Harvest tune of the same name, the only thing giving it a distinctive edge being some Grateful Dead-like acidic lead runs from Richard Treece. However, as the Help’s Old Man was recorded before Young’s version by at least a month, probably longer, one can only assume it is nothing more than a coincidence arising from the Help’s obsession with the West Coast sound in general, and on this song, Buffalo Springfield in particular. 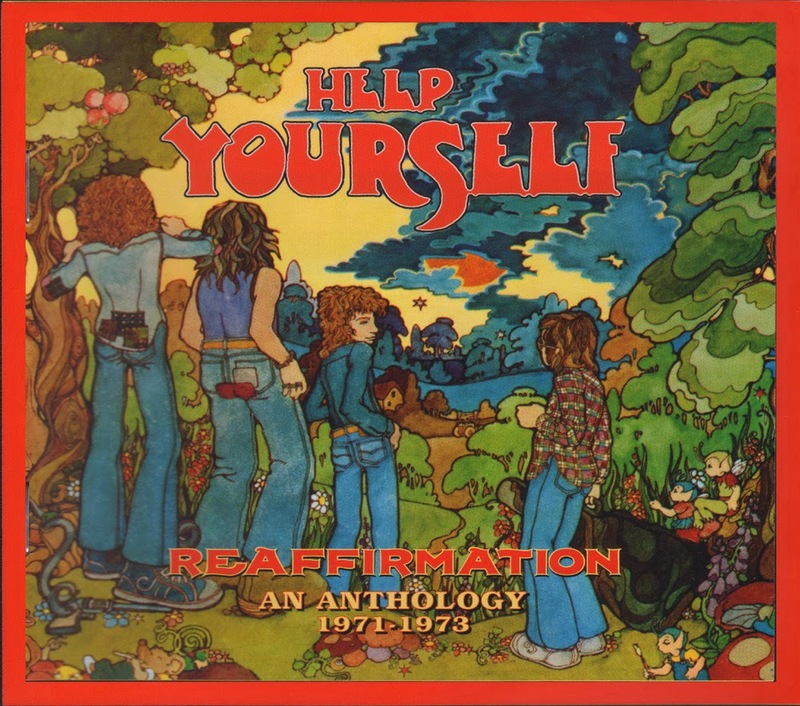 Reaffirmation contains six tracks apiece from the first two LPs, with second album Strange Affair, released in 1972 seeing an enforced change of personnel. Bassist Ken Whaley was ousted by the management who considered that the group’s communal idyllic stoned existence at Headley Grange, recently vacated by Led Zeppelin, was not exactly conducive to the work ethic. Whaley himself described the band as living in “drugged out bliss” – hippies, eh? Doncha just love ‘em? By sacking Whaley, they hoped it would give the rest of the Helps a much needed kick up the collective backside. Richard Treece took up the bass, and Ernie Graham (ex-Eire Apparent) and JoJo Glemser were drafted in. Around the time leading up to Strange Affair Malcolm Morley, who was suffering from undiagnosed depression, took more of a back seat with front man duties falling to Graham. That and the initial absence of the spidery acidic wanderings of Treece’s guitar makes Strange Affair take more of a country rock route, with big nods to Poco and America, especially on Brown Lady. The newly arrived duo of Graham and Glemser had no sooner plugged in than they were off again, leaving during the recording of Strange Affair. Treece returned to the lead guitar with Paul Burton filling the bass position. Blimey, this lot have more comings and goings than Chelsea football club! As well as the country rock, Burton’s R&B style seeps through on funky proto-pubrock numbers Heaven Row, a particularly classy number, and the title track. The pubrock connection also arises with the long workout The All Electric Fur Trapper which was based on a story by roadie Sean Tyla, later to lead his own barrelhouse rabble-rousers Ducks Deluxe. However, there is no pubrock connection musically on this song, as the nine minute-plus mini epic is a psychedelic paen to Quicksilver Messenger Service, and quite wonderful it is, too. Many Ways Of Meeting and Deanna Call And Scotty show an identifiable Help Yourself style emerging from the Americana roots, the latter being a piano-led ballad that sounds like the kind of classy pop song of the time that Clifford T. Ward would have been proud of. Malcom’s continued battle with depression is reflected in the title of third album Beware The Shadow, released in late 1972. At various points between the release of Strange Affair and Beware The Shadow either Deke Leonard, then on one of his sabbaticals from Man, or Sean Tyla were drafted in as replacements for Morley while he battled with his demons, the latter flitting between the status of roadie and front man on the whim of Morley, depending on his state of mental health – it can’t have been easy for either of them. The Helps establish their own sound on Beware The Shadow with an effortless laid back funk that stands as a British parallel to Little Feat. The title track to this compilation starts out as a blissed out keyboard-led stroll through a leafy glade, with Paul Burton’s heavily reverbed bass adding an extra layer of groove. The tune then changes tack to a trademark solo from Treece, and then into an extended funk-lite workout. One can see how easily this would fit into Man’s repertoire when Morley and Ken Whaley both joined that band after the demise of the Helps in 1973. Passing Through, the concluding track on CD1 is a quite lovely and highly accomplished acoustic ballad, showing how the band were developing at a pace. The second CD is a less consistent affair, the album cuts being broken up by a novelty Xmas single and ending with an extended live wigout, but it is no less fun for all that. Opening with another of Morley’s superior pop songs, the straight love song She’s My Girl underlines the fact that Beware The Shadow, despite the sad subject of its gloomy title is by far the band’s best and most enjoyable album. The supremely daft 1972 Xmas single, Mommy Won’t Be Home For Christmas, penned by Neil Innes and Roger McGough is an amusing, if jarring interlude, and after a refreshingly different live barroom take on Johnny B.Goode, we venture on to the fourth album. The Return Of Ken Whaley was released in 1973, which as the title suggests sees the original bass player rejoining the fold. A return to communal living, this time in Finchley, north London leads to a looser and slightly less coherent recorded statement. However, with the exception of It Has To Be the album is surprisingly tight, with a continuation of the Anglicisation (is that a word?) of their sound. On Candy Kane, Morley’s nasal whine sounds not a million miles from John Lennon. From Buffalo Springfield to The Beatles in four albums, the Helps were coming home! The aforementioned It Has To Be was an extended jam under the influence of an acid trip, with drummer Dave Charles adding spontaneous synthesiser. As jams go it’s ok, but I’ve heard better, not least from their mates Man. Speaking of whom, The Return… contains Man, We’re Glad To Know You, a musical thank you to their musical colleagues and mutual support network…ah, bless. The convergence with the Welsh wizards continues with Blown Away, which could easily have been a track on a Man album of the time. Released as a free bonus LP with The Return… was Happy Days, a document of the live show toured earlier in the year. There are two tracks from it, Virginia and I’ve Got Beautiful You. The former returns to the Helps’ west coast fixation, and the second is a quaint rock’n’roll and West Coast mix. The band split in the summer of 1973 during sessions for a fifth album as the mounting pressures on Morley to continually come up with the goods began to take its toll. The fifth album was eventually completed and released as “5” in 2002, on the Hux label. It is actually rather good, and if you like what you hear on this collection you should certainly check it out. Sadly Ken Whaley passed away last year, but Malcolm Morley remains active, and info can be found on his website (see link below). To conclude, Reaffirmation is a classy summation of a band that are something of a lost treasure. 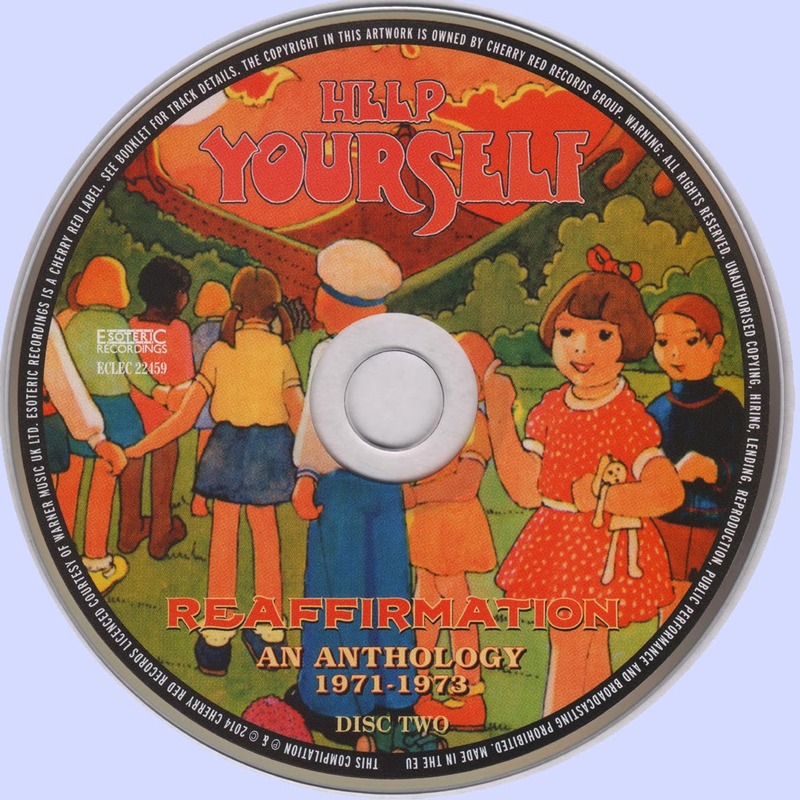 If you have never heard of Help Yourself and you are partial to West Coast sounds and the free spirit of 70s rock music, then do please help yourself to this charming compilation.